Add custom attributes to your inventory to track data that is not available as a pre-existing field in Bindo. Create a custom attribute called "Season", and assign each product a value such as "Fall", "Spring", etc. You can subsequently filter products by Season in the POS, or pull a Product Sold Breakdown Report that includes the "Season" value for each product sold. Create a custom attribute to track a third-party identifier to a Bindo product for the purposes of an integration. Create custom attributes that are supported as part of our Shopify integration or BigCommerce integration. You may create custom attributes manually on the Bindo Dashboard or you may create them by using the inventory import tool. To create a custom attribute on the Bindo Dashboard click on Settings > Custom Attributes in the sidebar menu. Click "Add New Attribute", enter your Attribute name (such as "Season", "Weight", etc.) and choose a Format. The Format dropdown includes two options: String and List. Choose String if your attribute values are not predefined. For example if you are adding "Weight" as a custom attribute, it would likely make sense to choose the String Format, because each of your products might have a unique weight. Choose List if your attribute values are predefined within a list of options. For example if you are adding "Season" as a custom attribute it would likely make sense to choose the List Format, because all products will be associated with a pre-defined option from a known list ("Spring", "Summer", "Fall", or "Winter"). To add list options click on the "Add Possible Values" button and enter the value in the text field that appears. Click Save to save your Custom Attribute. Next, add a value for the custom attribute to products in your inventory on the Inventory page. 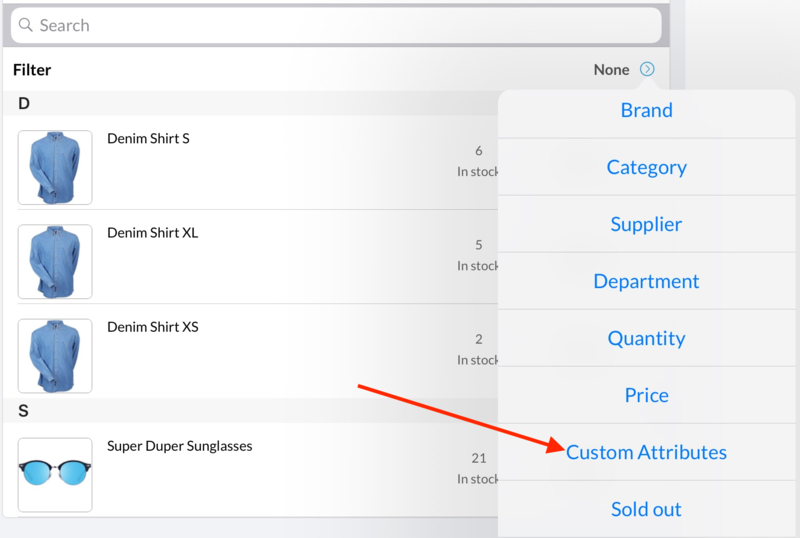 Click on Inventory, click on the product that you want to update, and click on the Custom Attributes tab. Click the Edit button at the bottom right corner of the page, add your attribute values, and click Save. Note that attributes set as "List" will appear with a dropdown menu, whereas those set as "String" will appear as a text field. If a custom attribute name already exists in your store the import tool will attach the new import data to the existing attribute (based on an exact name match). If you the custom attribute name does not exist in your store the import tool will create a new custom attribute. The import tool creates all custom attributes with the Format "String" . Custom Attributes can be used for various integrations, but in addition to that there are several functions within Bindo that utilize them. Custom attributes appear in your Product Sold Breakdown Report. Please note that this data appears in the exported file only. Each custom attribute attached to a product sold in the selected time period is added as a column on the report. You may filter your inventory by Custom Attribute on the Register or Inventory page. To do this, tap on the blue arrow in the Search bar, tap Custom Attributes, tap on the attribute that you would like to filter by, and then tap on the value that you want to target (you may tap on multiple).